This quote makes us at the Camellia Inn feel so much warmth in our souls because one memory can indeed last a lifetime. 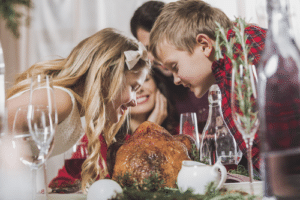 Whether it’s the food, family, friends, snow, or mistletoe, the Holidays will allow all of us to experience something that we can all put in our memory banks. Therefore, we want to bring to your attention these upcoming events in Healdsburg. We want you to have the opportunity to plan a trip during this Holiday season to experience new lasting remembrances. One of our favorite events in Healdsburg during the Holidays starts this Friday November 23rd. This is one of those free events in Healdsburg where Businesses have decked their windows with gifts and holiday cheer. This Holiday Window Decorating Contest brings out the best spirit of all who take part in it. You the viewing public will determine the winner. Voting starts November 23rd and ends December 24th. Last year’s winner was Thumbprint Cellars. Head to downtown Healdsburg to vote and experience the joys of the Holiday season. Starting on Saturday November 24th and lasting until December 23rd, you can take part in one of the community’s important events in Healdsburg. Head on down to Matheson street and bring your families and pets. You can get your gifts wrapped while donating to a wonderful cause, the Humane Society of Sonoma County. Get your picture taken with Santa as well. Honestly, it’s a win-win for all who take advantage of this events in Healdsburg staple of the season. There are so many upcoming events in Healdsburg to talk about. These ae just a handful we think you can enjoy over this thanksgiving weekend and into the first week of December. The events in Healdsburg happening in December is plentiful. Check back in with us at the Camellia Inn for all upcoming events in Healdsburg, or to book your stay. We look forward to hearing from you. Happy Holidays!